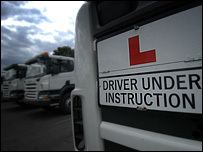 From today (10 September 2009), 18-year-olds will be permitted to drive lorries. Until now, the minimum LGV driving age was 21, but this has been lowered across the European Union to try and encourage more young people into the haulage industry. BBC Radio 1’s newsbeat reports the story of Adam, an 18-year-old who works for his father’s waste company. Until now he’s been helping out, knowing that it would probably be a while before he got to drive the lorries himself. But today, he took his first lesson in an LGV. An extra qualification has also been brought in – the Driver Certificate of Professional Competence (CPC), and all professional lorry drivers will need to have one. For more information on Driver CPC, click here. However, concerns have been expressed about just how many driving jobs are out there for teenagers who do get their licence. Jo said this should improve once the recession’s over: “Sadly there have been an awful lot of redundancies in the industry, so when the recession is over we’re concerned there’ll be a severe skills shortage because the older drivers will have gone into retirement. 18 years and driving an LGV eh? I dont think so not through me at any rate. I would rather loose the money and the booking that attempt to place a teenager in the same lorry as myself especially behind the wheel! what sense do they have in their little heads for driving a blooming car let alone a 44 ton lorry. Even if the insurance companies give them clearence and beleive me very few will, as an employer I would not even entertain the thought of allowing one loose in a machine that even experienced drivers have difficulty with. Unfortunately those that may go for this are just the types that will be exploited by employers and forced to do long hours and cut other corners to bring down the wages of the industry and so place the whole industry back into the dark ages. Oh the driver CPC will make them good as it gives them training I hear you all shout, unfortunately it does not work that way. experience and safe practices only come with age and not youth. i think this is a good step by lowering the driving age of lgv’s to 18 because like in any trade and buisness if there is not enough young emloyers in a trade when people start to retire there will b a shortage young people do not get the credit they deserve like such as who is fighting and giving there lives out in afghanistan people say that we are not mature enough to operate such a large vechile yet the government is quite easy to shove 18yr olds out in afghan driving hgvs nd tanks ect… i can understand why it will annoy alot of the older generation drivers out there. As i can understand the fear the have or letting sumone with only a year driving experiance behind the wheel of a 44tonne wagon but the industry needs more drivers and if 18yr olds such as my self want to drive hgv’s if we get our licences then wats to say were not as able to do it as say a 40yr old . les kelly.My dad has been driving hgvs for well over 35 years doing continental reefer work.if you think that experienced drivers have trouble handling vehicles this size then you obviously are in the wrong job yourself.Reducing the age is the best thing they have done i am 19 with a child and wife and a house to run.i have been shunting artics and class 2s round my dads yard since i was 11 and never had an accident.18yo probably would hold more pride about holding the licence more then you probably do.us young ones who are interested in taking there hgvs now are probably more interested in the job then older drivers.as when before you had to wait till you was 21 so this put alot of youngsters like myself of the job and led into other professions and led away from there dream jobs.i can’t wait to get on the road and earn a living on road like my family has for decades. Good luck to any 18yr old wanting drive lorries – you will need it ! Firstly,who is an employer going to recruit – a 25+yr old newly passed hgv driver with say 5+ years car driving experience or an 18yr old with a maximum of 1 year on road driving experience. Secondly, their is the issue of insurance. Premiums are massively hiked up for the 17-24 yr old age group as they are statistically proven to more likely to be involved in an accident. No employer is going to pay the grossly inflated premium to insure a teenage novice when they can pay a fraction of that with an experienced driver aged 25+. Can you imagine just how much they would quote an employer to insure 18yr old to drive a 44 ton artic £££. I passed my class 2 aged 35 and it was hard enough to get a job with no experience. Once I passed, as again for insurance purposes most employers want atleast 1 years experience so what chance does an inexperienced teenager have! As for a national shortage of drivers that may have been the case 3-4 years ago but now due to European migration the hourly rate for hgv has actually fallen due the ammount of overseas drivers now working in the UK. I am 19 and passed my class 2 driving test a few months ago. I spent around £4000 to get here, including a doctors medical DSA test fee’s, extortionate training costs (with the wrong training company!!!) training with a better company and additional fee’s for the Driver CPC tests. I have had great difficulty finding class 2 driving work in NW England and have got too used to being told I am too young for allmost all insurers to make it profitable as a driver. Being able to honestly write on my CV that I have extensive experience working face to face with the customer helps little either. I thought I would take a minute to write down my experience of upgrading my licence to class 2 and my general ideas for it. I did my GCSE’s and 2 years of A-levels alongside full time work in various restaurant cafe and construction jobs with some van driving as i said before and I found many driving jobs advertised whilst looking for my next job about 6 monhts ago and rushed into my training to get one of those many jobs advertising hourly pay of between 7 and 10 pounds only to realise i might end up being a truck driver slightly longer than i had hoped especially if i wished to make a decent wage as a driver. I work on building sites and see lorry drivers every day and tbh I can see that it probably is a hard job, long hours and bad pay(for what is asked of you). Though they have brought the age down it’s going to be unprofitable to hire an 18 year old as a lorry driver, as has been mentioned, but if no older people want to do it then maybe lorries could in the future be driven exclusively by youngsters…… as if. Explain to a 18 year old lad or maybe even lass about how they could get a similar wage in a much easier office job, and that the only way they will get enough money to get a mortgage is to go to all over the country and abroad, add in the fact that they will have next to no social life and be in a lorry all day, well I’d say that your unlikely to see many of todays youth doing that awful job. Why would you wan’t to do that at 18 anyway? ; it just makes you wonder what’s wrong with some kids. I don’t think this is true there are routes into the truck driving for an 18 year old. I’m 19 now but was working for a local haulage company within a month of passing my class 1. Now I drive for a company you’ve all probably heard of eddie stobart ……. And have never had any issues with my age because when they recruited me they take you on an assessment drive is carried out, and they use this to look at you fairly and determine your skills. I’ve even managed to do manoeuvres first time that even 30 years seasoned truckers have a struggle with. So the typical age stereotype is wrong. I’ll admit there are some younger drivers out there that just ruin it and create the stereotype for responsible truckers such as myself. I think that many young drivers can make it into haulage, you just have to prove how good you are. Hey I have been reading all the comment and I have just pass ma hgv1 and I got a job with Eddie Stobart. Driving as a Tamper and I just earn over 650pound a week I love ma job and I am only 19 year old so it not about what age you are it is are u willing to put the hours in and work. All the people with so little faith in young hgv drivers make me laugh!! I’m 18, 19 in four weeks and about 4 months ago I gained my hgv licence. After receiving my licence I got a job within 3 weeks!! I started on 325 a week but after three months I proved I can do the job well, so my boss gave me a pay rise to 430 a week! Plus over time! And I always do at leaste 10 hours a week over time. I’m on excellent money I own two cars and rent my own property. Don’t listen to all these jealous older hgv drivers they are trying to uncourage younger drivers to get into the industery. To be honest its the best decesion I’ve ever made, becoming a hgv driver couldn’t be simpler! So why do people think young drivers will be so crap,I passed my HGV test aged nineteen in the forces.Yea I can hear you all saying ”Well thats different”. Why is it,I had a civilian trainer and civilian examiner,and once I passed was allowed by the Army to ferry all sorts of loads around,including ammunition and explosives also later on I carried aviation fuel. Dont slag off young drivers wanting to drive HGV’s as once behind the wheel,there perspective changes,they will see that there is much more responsibility involved,so instead of tarring all young lads/girls with the same brush,lets not only give them a chance,but also give them help and support on there way. Incidentally I have now been a lorry driver for 37years and would welcome young drivers to take the opportunity to follow in my footsteps,LETS GIVE THE KIDS A CHANCE. We are all too quick to slag them off branding them all Boy Racers. Which is wrong..Rant Over lol. i hv heard what u guys hv said about the youngsters driving hgv. is good for youngsters cos as for me am from GHANA and nigeria, in my father and mothers country youngster drive hgv as from 17 upward, and they even drive better down older drivers is not by age nor by side, is just by what u determine, and life styles also if ur father is a driver and u pay attention to the job that ur father do u well do as well.don`t judge yound ones am 30year of age now. I hope all the people (including MPs and MEPs) who supported this crass proposal will now publicly admit they were wrong, irresponsible, and share responsibility for the tragic deaths in Bath February 2015 of a little girl and 3 adults.